On Friday, NBA commissioner Adam Silver named Miami Heat guard Dwyane Wade to the NBA All-Star Game as a special roster addition. The NBA is now in its second year of a new format where two captains draft their All-Star teams instead of the traditional Eastern Conference versus Western Conference game. 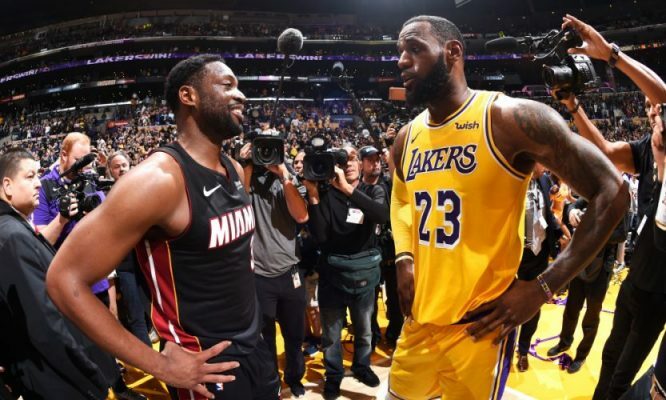 One of the two captains this year is Los Angeles Lakers forward LeBron James, who is a former Heat player and close friend of Wade’s. After the Heat’s 118-102 loss against the Oklahoma City Thunder on Friday, Wade made clear who he thought James should pick in the draft. James will have his opportunity to pick Wade with the first pick in the third round of the draft. The draft will be on Thursday, Feb. 7 at 7 p.m. ET on TNT. This is the 13th time in his 16-year NBA career that Wade has been named an All-Star. So far this season, the 37-year-old is averaging 13.6 points, 3.6 rebounds and 4.3 assists per game. Earlier on Friday, James tweeted out his approval for Wade’s selection to the All-Star team. As for the All-Star Game itself, that will happen on Feb. 17 in Charlotte, N.C. at 8 p.m. ET. The game will be nationally televised by TNT.